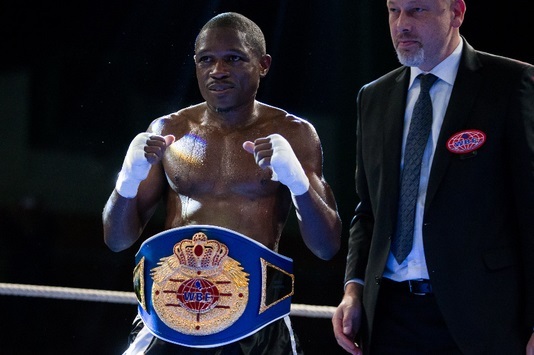 Christmas indeed came early for Swiss boxing fans on Thursday, December 13, at the sold-out Cirque de Noel in Geneva, when World Boxing Federation (WBF) World Super Featherweight Champion Patrick Kinigamazi took on Scottish challenger Jordan McCorry. Making his third defense of the WBF World title, Rwanda-born Kinigamazi was faced with a very determined and gritty opponent in the man from Cambuslang on the outskirts of Glasgow, and while the champion eventually took control when he found his distance, McCorry battled hard all the way to stay in the fight. In a great atmosphere, created by local as well as quite a few Scottish fans who had taken the trip to Switzerland, it was a very intense and heated contest, with both men suffering cuts and bruises from accidental head-clashes. None of them big punchers, this was always very likely to go the distance, and after twelve rounds of what must be considered a very serious candidate for WBF Fight of the Year honours, Kinigamazi was awarded a hard-fought, but deserved, unanimous decision. Judge Robin Reid, the former WBF, WBC and IBO World Champion, scored the fight 116-114, while judges Beat Hausammann and Jean-Marcel Nartz had it wider at 117-111 and 118-110, all for Kinigamazi who improved to 30-2 (4). McCorry drops to 17-4-1 (4). Promoter of the fight was Tundra Promotions, in association with Noblem Promotion and Boxclubs Carouge.